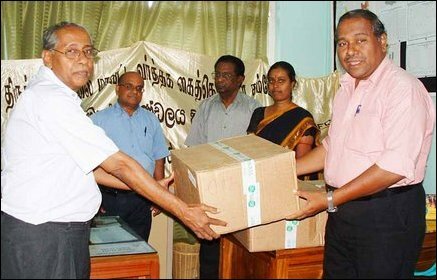 The medial equipments in 180 cardboard boxes were handed over to the provincial health authorities through the Chamber of Commerce of Trincomalee District (COCO-T). The items included Forehead Thermometers, Sticking Plasters, Gloves, Medical Boxes and Hand Wipers, sources said. Mr.P.Wickramanayagam, Vice Chairman of COCO-T handed over the consignment to Dr.E.G.Gnanagunalan, Maternity and Child Health Medical Officer of the provincial department of health at an event held in the provincial health ministry, sources said. Mr.R.Rajarammohan, General Secretary, COCO-T, Mr.Geetha Fontgalland, Chief Executive Officer of COCO-T and Ms Panchalingam Gayathrie, Information Officer participated in the event, sources said.